This year, Eurofins Lancaster Laboratories used the cloud-based GreenIntelli Sustainability software to track and analyze our social, environmental, and economic performance. This software allows the facility to organize and interpret data in a single, comprehensive location. The WRI GHG Protocol compliant Carbon Management & Reporting solution is used to report our carbon footprint. The Greenhouse Gas (GHG) protocol defines measurement, management, and reporting standards and was developed by World Resources Institute (WRI) and World Business Council on Sustainable Development (WBCSD). Here you find a great example of Eurofins Lancaster Laboratories sustainability report. Getting started to manage and report your sustainability has never been easier. GreenIntelli, the GRI G4 certified software, takes sustainability reporting to the cloud providing a KPI based reporting platform at a low threshold entrance. Especially for organisations that start with Sustainability Reporting or organisations that are taking a next step in managing their sustainability performance, the platform enables collaboration and supports the data collection and reporting processes. Similar to Sustainability Reporting, there are low threshold solutions for Carbon Management & Reporting and Sustainability Performance Management & Reporting securing support for each maturity level of the organization. Get started today and request for a FREE user or DEMO. We are joining forces with Eccentrade to develop an online business to business information platform designed to provide transparency for assessment of (potential) suppliers and benchmarking of suppliers. Eccentrade delivers an online data platform combining profiles of suppliers (currently 3.5 million) with financial, trade and media data. Our GreenIntelli 2.0 data platform will be used to deliver sustainability data using the Future Fit Business Benchmark. Combining business with sustainability data will provide full supplier transparency to design your own sustainable supply chain. In case you are interested to see how this works, feel free to contact us. 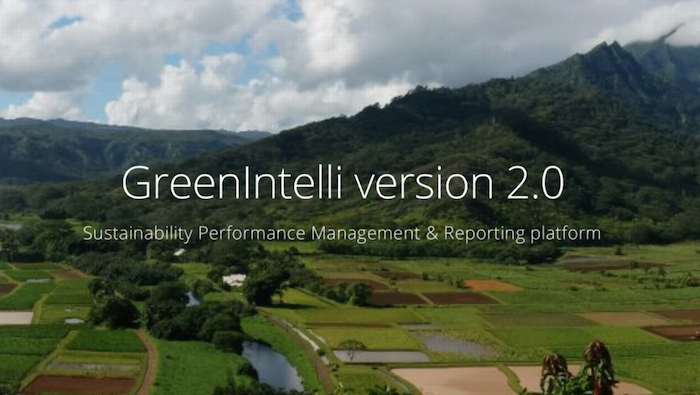 We are proud to announce that GreenIntelli 2.0 has been released. The cloud based Sustainability Performance Management & Reporting platform has been extended with new functionality, such as an improved look and feel, interactive dashboard and multiple reporting and consolidation unit of measures. GreenIntelli 2.0 has been certified for GRI G4 Sustainability guidelines and has received the Built on GHG Protocol Mark. Latest enhancements include Supplier Assessment functionality, allowing you to define Supplier questionaires for Supply Chain data integration, supported by workflow functionality to mass communicate with your partners. In case you are interested to improve your Sustainability Performance Management & Reporting, feel free to contact us for a demo and our GreenIntelli 2.0 introduction offer. We are pleased to announce that we have passed the review of the WRI GHG Protocol and received the ‘Built on GHG Protocol’ mark. GreenIntelli’s functionality for Carbon Management and GHG reporting now formally adheres to the global standard WRI GHG Protocol. Feel free to contact us for any inquiries related to Carbon Management and GHG reporting. The certification process for GRI G4 has been completed just before the holiday season. GRI G4 Certified Software means that GRI’s G4 Sustainability Guidelines are implemented in GreenIntelli or differently, GreenIntelli Sustainability Performance Management and Reporting fully adheres to the GRI G4 Sustainability Guidelines. GreenIntelli includes all specifics out of the GRI G4 framework and we have developed specific GRI G4 functionality to enable the GRI G4 reporting process. Feel free to contact us for any inquiries related to the GRI G4 Sustainability Guidelines or a GreenIntelli demo. 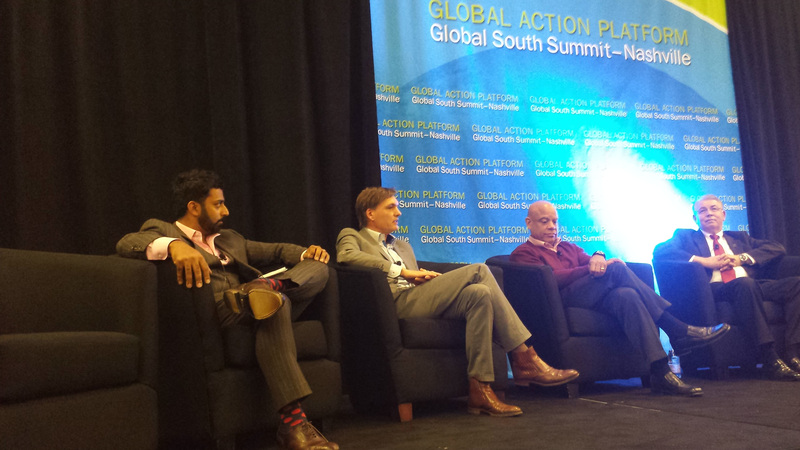 Thanks Global Action Plan and Nashville for having us at your conference. It has been great to present GreenIntelli as part of the Global South Summit this year. The plans and ideas around solving global food and health issues have certainly motivated us to further develop GreenIntelli for the support of Sustainability Supply Chain Management issues. And thanks to all participants of the panel discussion – Abundance Intelligence – A Systems Approach. It was good to share views and visions around Big data and data structures to support Sustainability Performance Management and Reporting. From left to right: Greg Kandankulam, Program Manager, Real New Energy and GreenIntelli; Erik Euwe, Managing Partner QVS Consulting, Founder GreenIntelli; Mark Dean, Ph.D., Professor of Engineering, University of Tennessee, former CTO, IBM; Ray Rodriguez, Ph.D., Director, Global Healthshare Initiative ; Moderator: Cynthia H. Barbera, Executive Editor, Global Action Report, Founding Leadership Committee, Global South Summit (not visible on the picture).